Victor Chapman was born in New York on 17 April 1890. Following his mother's death in 1898, his father moved to Europe and remarried, Victor moving with them. As a teenager he returned to the United States to complete his education, but following the outbreak of WW1, he returned to France and enlisted in the Foreign Legion. Over the next two years he served with the Legion in the trenches, but when word reached him that some influential Americans were attempting to start a purely American aviation unit within the French air service, he applied for and was accepted for pilot training. After the completion of his training in early 1916, he was transferred to Luxueil along with six other Americans, all of whom became founder members of Escadrille N.124, the Lafayette Escadrille. On 23 June 1916, together with three squadron mates, he attacked a number of German scouts just North of Douaumont. After a brief and inconclusive skirmish, his comrades wisely withdrew, but Victor chose to continue the attack alone, and was cornered and shot down and killed. He was the first American, and the first member of the Escadrille Lafayette, to die in the air war during that conflict. 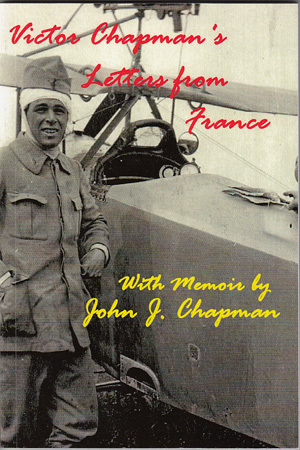 His letters and memoir were published in book form by his father after his death, with the simple title "Victor Chapman's Letters From France".